Jackie Gleason (John Herbert Gleason; February 26, 1916 – June 24, 1987) was an American comedian, actor, and musician. He was known for his role as Ralph Kramden on The Honeymooners. 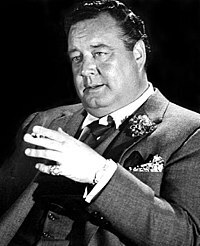 Among his most noted movies roles were as Minnesota Fats in the drama movie The Hustler (1961) starring Paul Newman, and as Buford T. Justice in the Smokey and the Bandit movie series. Gleason's career would span for nearly 41 years until his retirement in 1986. Gleason was born on February 26, 1916 in Brooklyn, New York City. Gleason was married three times; first to Genevieve Halford from 1936 until they divorced in 1970. Secondly he married Beverly McKittrick from 1970 until they divorced in 1975. Lastly he married 1975 until his death in 1987. Gleason died on June 24, 1987 in his Lauderhill, Florida home from colon cancer, he was 71 years old. ↑ Konicki, Steve (June 25, 1987). "Gleason's death came quietly at age 71". The Miami News. Retrieved November 19, 2010. This page was last changed on 31 August 2017, at 04:18.